This week is National Obesity Awareness Week – a time to reflect on how being overweight can affect health, how to eat more healthily, and to consider being more physically active. The risk of developing weight-related health issues is why Life Insurance companies need to know your BMI (body mass index) – a measure that uses your height and weight to work out if your weight is healthy. Does having a high BMI mean that it’s impossible to find Life Insurance? Well, it does usually mean the price of the insurance is higher compared to someone with a healthy weight and no other health problems. But you may be surprised to learn that, even with a very high BMI, it’s still possible to get Life Insurance. 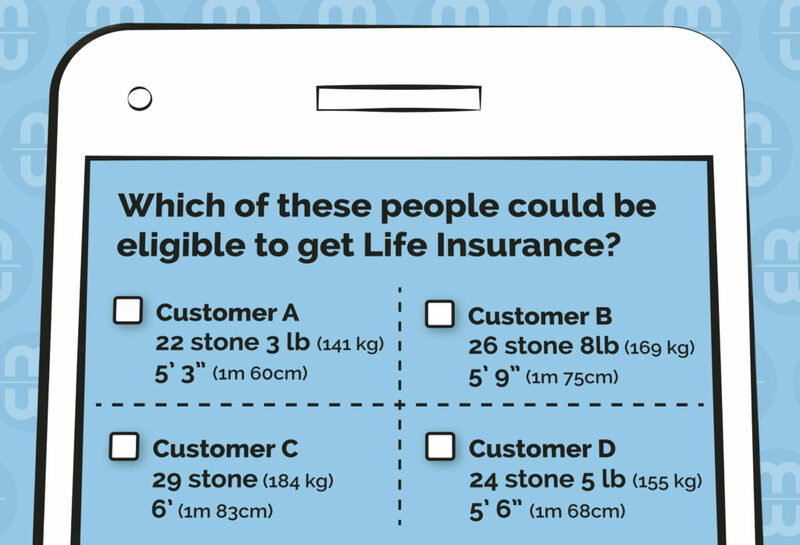 So, which of the example customers in the picture above could be eligible to get Life Insurance? The answer is ALL of them! Each of the four people has a BMI of 55, which health professionals consider to be in the very high range of obesity levels. Different insurers set different maximum BMI limits. So, even though these four people have a high BMI, some insurers may offer them Life Cover. That decision, and the price offered, will of course depend on other factors too, such as the applicant’s age, other health conditions and any relevant family medical history. If you know your height and weight, you can use the NHS’s Healthy Weight Calculator to find out your BMI. If you have a high BMI but no other health problems, why is your Life Insurance price higher? Even if you’re still in your 20s or 30s, you feel healthy and high BMI is your only medical issue, you may be charged more for your insurance cover. This is because insurers don’t just consider your present state of health – they also assess the effect of the raised BMI throughout the proposed term (length) of the insurance cover that you’re asking for. What if I lose weight after I’ve started a Life Insurance policy? Recently, we’ve found some insurers who will offer to reduce the monthly cost for your life cover if your BMI improves due to weight loss. What about Critical Illness Cover and Income Protection? Critical Illness cover and Income Protection cover are typically harder to obtain for people with a high BMI, especially if there are other health conditions to consider. But it may be still be possible for some people – it all comes down to your overall circumstances: BMI, age, other health conditions, family medical history, etc. How can you increase your chances of finding Life Insurance if you have high BMI? Most mainstream insurance companies will have a tolerance level for BMIs up to around 40-45, providing there are no other health conditions present. If you have other healths conditions too, or have a BMI higher than the mid forties, your search for cover is mostly likely going to be harder. This is why asking an expert to shop around for you is a good idea. Moneysworth have over fifteen years of success in finding life insurance for people with high BMI and other health conditions. We are usually able to obtain life cover for a maximum of BMI of 55, and in some cases even up to 60. We don’t charge clients any fees to search the insurance market, so it won’t cost you a penny to ask us to fully explore your Life Insurance options. Learn more about Life Insurance and high BMI / Obesity.